Nikki Hill’s name has been bandied about in the Blues circles I travel in for some time now but it was just recently that I was able to see her live here in Colorado and discover what all the fuss is about. This Blues woman from North Carolina is a force to be reckoned with and is out on the road earning her fans, one fan at a time. 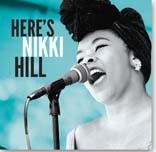 Her debut disc, Here’s Nikki Hill, is aptly named and a high energy ride from top to bottom so let’s give it a spin. First tune out of the box is “Ask Yourself,” and Nikki is calling out her man to make up his mind to commit to her or move on. “I’ll give you one more time before I go…cause I’m not your little so and so…ask yourself if you’re ready to be my baby…or, baby I’m over you.” This really should not be a complicated decision from my perspective but then, I’ve sometimes questioned the sanity of my gender for years! Up next is “Her Destination,” and here we find Nikki warning a rival for her man to get out of the way or face the consequences. “I’m going to give you girl, a warning…before you try to put one on me…the last little girl to cross my path…is sitting in the deep, blue sea.” It’s all pretty clear to me and the girl will heed Nikki’s warning if she’s got a mind at all. Nikki’s husband, Matt, an accomplished artist in his own right, is on the guitar and is tearing up his solo for this tune. Nikki’s proud of her man and she continues to tell us this in “I’ve Got a Man.” “I’ve got a love…so sweet and true…he’s so fine…yeah…I can’t help myself…I hope I never….never…never…share with nobody else.” Nikki’s got a good man, one she loves so much and hopefully it all works out for her sake. “Strapped to the Beat” is up next and brings the saxophone of Steve Eisen to the mix. Steve blows a mean horn and it’s the focus of this tune. “I’m strapped to the beat…feel it down in my soul…if you move your feet…to the rock and roll…start your move when he blows that horn.” A lively tune and one that the band gives a great deal of energy to. Kind of a calypso beat provides the backbeat for “Who Were You Thinking Of?” and here Nikki is completely aware of the fact that she wasn’t the woman on her man’s mind when they were making love. “Who were you thinking of…when we were making love…last night…as it a good looking stranger or a close friend of mine?” No matter what the answer is, it’s for sure that Nikki wasn’t the one on his mind and she’s going to have to deal with it. Nikki’s an amazing talent and has a rock solid band behind her on this musical journey of hers. Here’s Nikki Hill goes way past announcing her presence to “Y’all had damn well understand I’m here” because we’re going to be watching and listening to Nikki Hill for many years to come. Order a copy of this amazing disc from her website or catch one of her lives shows and grab it there. Either way, get a copy for your collection. Nikki is that good!